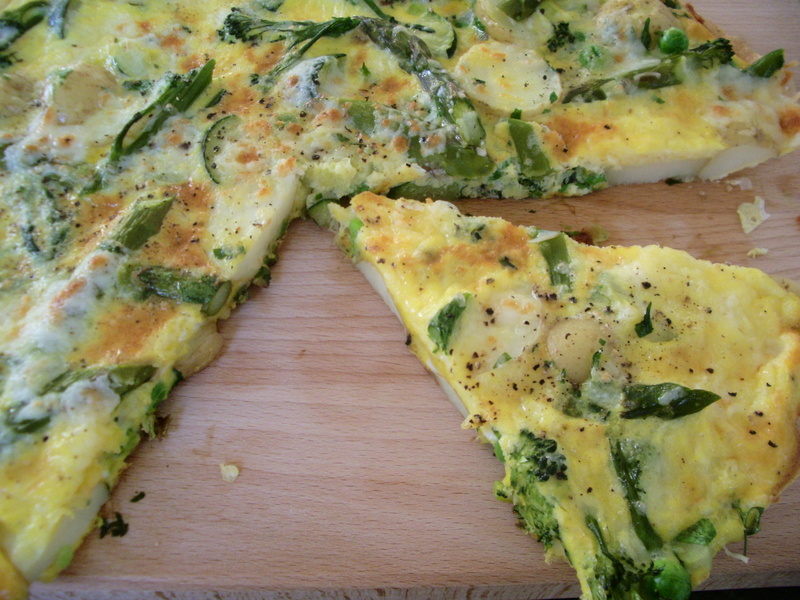 Frittata is an egg-based dish similar in some ways to both omelette and quiche. I actually prefer it to either of these, finding it more enjoyable – and satisfying – to both cook and eat. Cut into slices, it can be excellent as a light lunch, and served with a hearty salad (or other suitable accompaniment) it can also be the foundation of a much more substantial meal. And if you make it large enough – which I usually do – then it can provide enough for both. It’s also extremely transportable, which makes it great for picnics. Of course, one of the fabulous things about a frittata is that is never has to be the same twice, and to be honest I don’t often follow a recipe when making it. But looking through my copy of Hugh Fearnley-Whittingstall’s Veg Everyday recently, this just really appealled to me. It’s just the right time of year to be making it – and I made the most of the new season Jersey Royals (new potatoes) as well as some beautiful asparagus. I did use frozen peas, but the addition of freshly-shelled peas and / or broad beans would almost certainly have made it even more special. But he basically had me at ‘goat’s cheese’ (I’m a complete sucker for it), and I took great delight in grating a hard variety – with an intense earthy, sweet and nutty flavour – over the surface before popping it under the grill to watch it bubble and colour. I had a couple of generous slices served warm for supper, along with a salad of fresh green leaves, avocado and olives. And there was plenty leftover for lunch the next day (and the next), when it was equally tasty at room temperature. Cut the new potatoes into 5mm slices. Put them into a large pan, cover with plenty of water, add salt and bring to the boil. Meanwhile, if using, cut French beans and asparagus into 3-4cm lengths; cut broccoli into small florets. When the potatoes come to the boil, add the green vegetables. Once the water has returned to the boil, reduce the heat and simmer for 3-4 minutes, by which time all the vegetables should be just tender. Drain well. Pre-heat the grill to medium. Heat the oil in a large non-stick frying pan over a medium heat. Add the spring onions and sweat for about 5 minutes, until soft. Add the drained vegetables and herbs and toss with the onions. Turn the heat to medium-low. Beat the eggs together with plenty of salt and pepper and pour over the vegetables in the pan. Cook gently, without stirring, until the egg is about two-thirds set, with a layer of wet egg still on top. Crumble or roughly chop the cheese and crumble over the surface of the frittata, then transfer the pan to the grill for a further 4-5 minutes, until the egg is all set and the top is starting to colour. 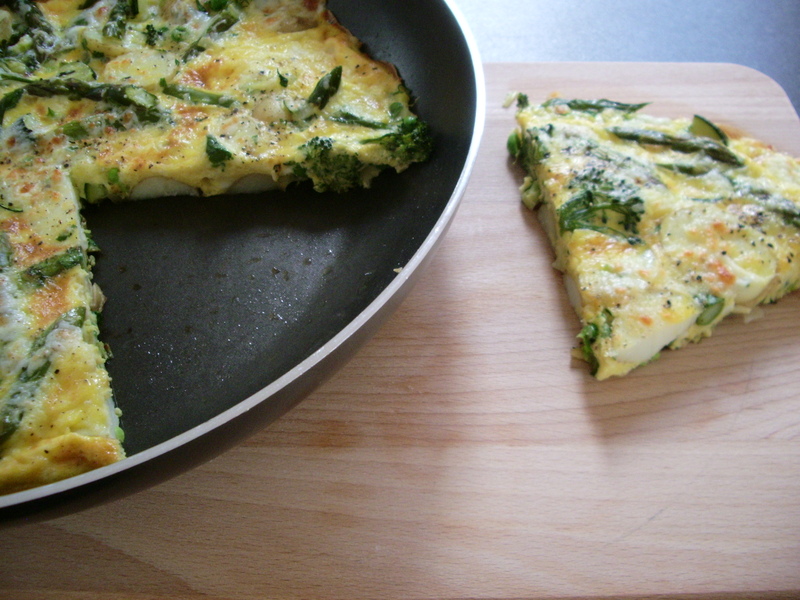 Leave to cool slightly, then slide the frittata out on to a plate or board. Serve warm or cold, cut into slices. This entry was posted in Food, Lunch, Recipes, Vegetables and tagged main meal, picnic, Supper. Bookmark the permalink. They’re great, aren’t they? And wonderful to play around with. I’ve never actually made a tortilla though, and don’t have a clue as to why… that’s definitely going on my ‘to do’ list. Yes, exactly. Basically, you pay a fee at the beginning of the growing season to a local farm, and they use it to buy all the things that they need — seeds, fertilizer, equipment — and in return you get a veg box of whatever is in season. Helps the farm by providing needed funds during a time of year when money is tight. It’s a great way to get your veggies. And I’m definitely looking forward to hearing all about the results. This is a nice recipe that I would love to try. It was certainly very tasty! Thank you. Exactly – it’s great for both of those. And the goat’s cheese really does finish it off beautifully. Yum! and paleo friendly! Thanks for the recipe, I’m going to try it out! I hope that you enjoy it as much as I did! Thanks for stopping by. 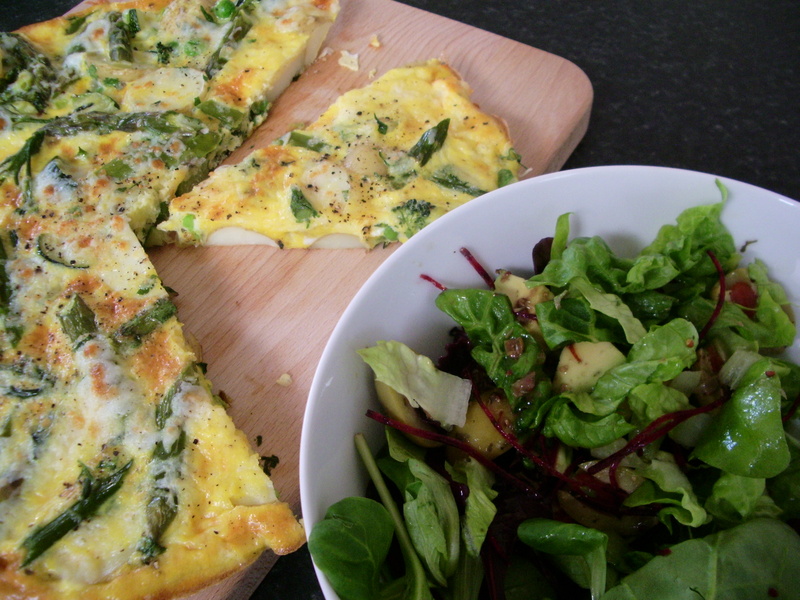 I made your tasty frittata just this way Loved it so much! It was just divine! It’s really lovely to hear that you made this – and I’m so glad that you liked it! It’s a great dish, isn’t it?